Home/Animals and Sound/Sound Reception/How do marine invertebrates detect sounds? Sound waves are characterized by compression and expansion of the medium as sound energy moves through it. This represents the pressure component of sound. At the same time, there is also back and forth motion of the particles making up the medium (particle motion). Animals can detect these different aspects of sound. The statocyst is a complex sensory organ found in most marine invertebrates. It primarily provides orientation cues that allow an animal to maintain its position in the water column. Some researchers believe that the statocyst may also function to detect the low frequency, particle motion component of sound. All cephalopods, except the nautilus, have a statocyst. Auditory Evoked Potential (AEP) studies (with electrodes placed near the statocysts) showed longfin squidresponded to sounds between 30 and 500 Hz. The animals were most sensitive at frequencies between 100 and 300 Hz. Auditory brainstem response (ABR) studies found oval squid and common octopus to be sensitive to sounds from 400-1500 Hz and 400-1000 Hz, respectively. In other studies, where the sensory function of a cephalopod statocyst was either chemically blocked or surgically altered, sensitivity to acoustic stimuli was not observed. 3D rotation of a cuttlefish (Sepia officialis) head showing the statocysts (the two small, bulbous objects in the center of the frame). Ketten Laboratory and the Computerized Scanning and Imaging facility (CSI) http://csi.whoi.edu of Woods Hole Oceanographic Institution. Some marine invertebrates possess other sensory organs that can detect vibrations transmitted through the substrate (“seismic signals”). Chordotonal organs are generally associated with the joints of flexible appendages (e.g. walking legs and/or antennae) and are connected to the central nervous system. Movements or vibrations transmitted through the substrate can stimulate the chordotonal organs. Specialized Barth’s myochordotonal organs (Barth’s MCO) are found in semi-terrestrial fiddler and ghost crabs. Externally, the organ can be identified as a distinct, thin-walled “window” in the exoskeleton on each leg. 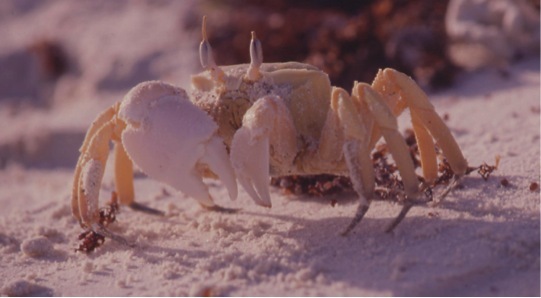 In ghost crabs, this sensory organ is receptive to both substrate-borne and airborne sounds, while in fiddler crabs, it responds primarily to substrate-born vibrations. The organ is thought to function in expanding fiddler and ghost crabs’ acoustic sensitivity to frequencies above 300 Hz. This would allow the animals to detect frequencies above the background noise in their habitat. Interestingly, if a crab were to lose a leg (to escape a predator or during a fight), the animal’s acoustic sensitivity would be minimally reduced. This is due to the fact that all walking legs contain the sensory organ, and hence, a crab would still be able to detect vibrations through its other walking legs. The crabs also appear to stop receiving acoustical input while they are walking. This would prevent the crabs from receiving vibrations associated with their own movements. Ocypode saratan, a species of semi-terrestrial ghost grab. These crabs possess Barth’s myochordotonal organs, specialized sensory organs in the walking legs that detect substrate-borne and airborne sounds. Image courtesy of David Clayton, Sultan Qaboos University (Oman). Factor, J. R. (Ed.). (1995). Biology of the Lobster Homarus americanus. San Diego: Academic Press.